There are several ways in which you can display details of a gridview row in order for the user to have a quick overview of the complete row. Especially when there are lot of columns in the gridview the user may find it difficult to scroll the page and view the details of entire row. This is why we have a control called 'DetailsView', a data-bound control that can be used to display single record at a time. There are many options to do this such as displaying details in a tooltip on mouseover event using jQuery, using AJAX ModalPopupExtender on click event etc. A more simple yet efficient approach is to display details of a gridview row in a modal popup dialog using Twitter Bootstrap's Modals plugin. 1. Download bootstrap files from here. 2. Include the latest jQuery library, bootstrap files (bootstrap.js,bootstrap.css) from the download and use below html code in .aspx page. <div id="currentdetail" class="modal hide fade"
In the above code, I have used a gridview and detailsview. 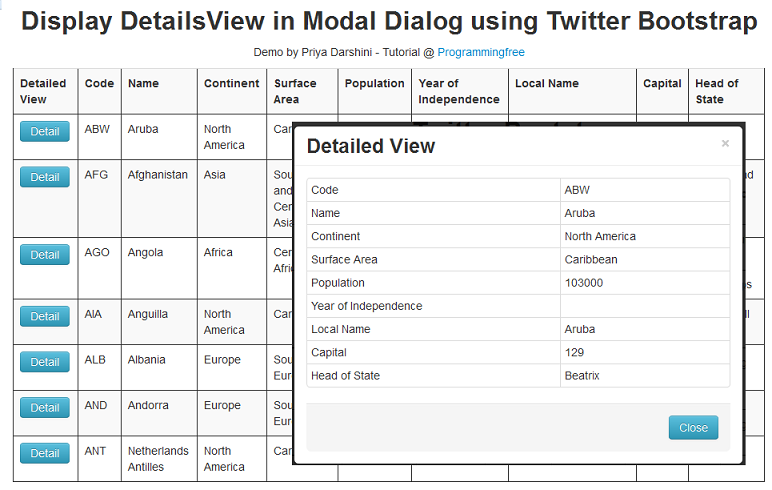 To open detailsview in modal popup on button click, detailsview is placed inside a div with class='modal'. 3. In code-behind page use the below code. 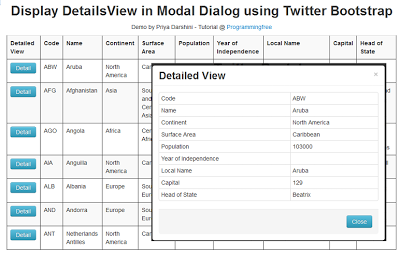 Here I am populating gridview with values from mysql table and using linq query to populate detailsview. Please leave your comments and queries about this post in the comment sections in order for me to improve my writing skills and to showcase more useful posts. Thanks for reading!! 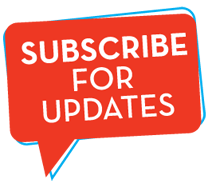 Subscribe to GET LATEST ARTICLES! Thanks amar! Sure I will try my best! I was trying a lot of options to style the ASP.Net GridView Pager contorl but was not successful. Can you help me with the same. Did you have a chance to look at this? By the way, what kind of styling do you exactly want to have on your gridview pager. Can you show an example? Have look at that but was not successful. some example is pager style I am looking at is http://cssdeck.com/labs/twitter-bootstrap-pagination-and-pager. :) Glad that you love it! I can't Make it work i can't see the popup window; i do everything like you say the only difference is that i use Master page in my code and i add all the scripts in the master page . Hello - thanks for the tutorial - very good! But I am having an issue where clicking the Detail button just refreshes the page - it adds the sb.tostring in the script tags - but nothing actually happens and it just refreshes the page? using master page and put references in contentplaceholder on the page using the site.master tried in ie. chrome, firefox too. Any suggestions you have would e greatly appreciated? i am referencing the js files within the content page and not the master page. I reference another js file in the content page in the same way which does a filter on a gridview as the user types into the text box,which works fine. Hello I manage to get it working - sort of..
so I did some research on internet and found that it was needed to be added after load complete etc.. which I did and it did not work..
and then it WORKED!!!! however, it only works for the first button click, then if another button is clicked, it refreshes the page, then allows you to click once again, then refresh, then click etc etc. Any ideas what that could be? Pls, I am a beginner of asp.net developer, i uses VB.Net i really need the script to call bootstrap modal from a asp.net button but all try yeild no reason, pls can you help me, maybe 1. You can help me with simple calling of the bootstrap modal from a asp.net button or send the sample code of this project to me my email is atplerry@gmail, atplerry@yahoo.com. I really appreciate your help Thanks. Hi Priya This All are Very Good Posts. Very Advanced Technologies Like Bottstrap. First of all, Thank you for your appreciation and comment! There is no such thing called Bootstrap GridView. GridView is an ASP.NET server side control and if you want it to look like Bootstrap table(http://twitter.github.io/bootstrap/base-css.html#tables) you can just add this attribute called CssClass="table table-hover" to your gridview. Hi, I'm trying to use this code but i got an error in rowcommand. (Index was out of range. Must be non-negative and less than the size of the collection. How could i resolve this problem. Have you set DataKey in your GridView? To use DataKeys[index], you need to set DataKey value to Primary Key Column name of your underlying table. This key will be used to get data for the detailsview, that corresponds to that particular primary key value. div id="currentdetail" class="modal hide fade"
How could i resolve this. i got no datarow error in this line. I have sorted out the problem and now it works. Really it was a good post of you. The demo is good. But i want to give edit option also in details view. Can you give update on this. Have you got the solution ? This article does not show how to use details view to edit records but you may have to create your own form elements to provide edit functionality. i am having a asp.net gridview and applying bootstrap classes table table-hover table-striped to it..it is displaying vertical lines. How can we avoid that? also i want the bootstrap pagination style to be applied to gridview, can anyone please help me on this.. I have used your code but modal is not showing. the details view also getting populated from code behind but modal not showing. I have posted my problem in the asp.net forum with detailed code.please check it to see the code and give me the solution for it. Great. This is what i'm looking for. Thanks for your sharing. Hi, I am using it for edit records, is it possible to hide popup on asp button click . When i am clicking button , popup hide , but page fade remains as it is. Do you want to close the popup automatically after user clicks on "save" button once editing is done? I tried the same code using 2008 VS Framework 2.0, when i click detail button in gridview am not getting the detailview but the page is not accessible with full grey. Please help me to get this feature, it is very nice. I advise you to check whether you have all the dependent libraries included using a modern browser. For example -> Google Chrome - Inspect Element - Network Tab. Refresh the page once after going to Network tab to see whether dependent files are included properly. You may also need to check the Console tab for errors. I have checked the shared link and tried the same but still facing the same issue. I copied the above code and changed the mysql connectivity only. And in console also am not getting any error, only warning ''Unknown property 'box-sizing'. Declaration dropped. if i want to add new data how can i modify modal? and button has a function to add data. how can i call codebehind ? hi do you have any code for this in vb? In which browser are you trying to open this? Check browser support for the version of bootstrap you are using. Chrome and IE.. both of them same result. Error: body.scrollTop is deprecated in strict mode. Please use 'documentElement.scrollTop' if in strict mode and 'body.scrollTop' only if in quirks mode. I did everything correctly, I suppose but the popup isn't showing up. Below is my snippet for your review. Since, most of you are having issues in getting this work, I am going to upload the sample application soon,which can be downloaded and used instantly. Stay tuned for updates. Whenever an user clicks on a button present in a gridview, gridviewrow_command event will be triggered.In case there are multiple button columns in a gridview, we can make use of commandname attribute to identify the operation to be performed based on this command. Dayo, o fo mi je gan an o (You fall my hand o). The modal pops up ok for me but it's showing the same detailsview for each row (row 0). Do you know what might be causing this to only pick up the first row and not for each row? Please I need Help !! I used Bootstrap 3.0.3 But Its Cannot appear any modal????? thanks for great article, but with mastepage it doesn't work, it show only gray backgroun. hi, i encounter the same problem also. did u figure it out already? please let me know. thank you. "Since, most of you are having issues in getting this work, I am going to upload the sample application soon,which can be downloaded and used instantly. Stay tuned for updates. Please, where did you publish the sample source code, because the popup is not popping up.